Researchers at the University of California Davis have discovered how to regrow a dog’s jawbone in a ground-breaking study that has the potential to change animal medicine as we know it. Biomedical engineer Dan Huey and veterinary surgeon Boaz Arzi developed the innovative bone replacement procedure while working as a postdoctoral research team. Huey and Arzi collaborated with UC Davis Professor Frank Verstraete, who heads the Dentistry and Oral Surgery Service at the school’s veterinary teaching hospital to perfect the technique. One of the dogs whose life will be forever changed is Whiskey, a 10-year-old Munsterlander dog from San Francisco. 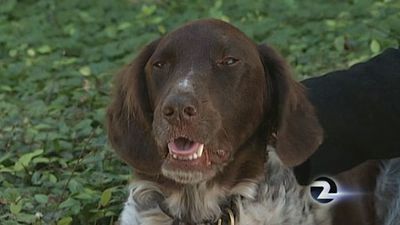 Owner Tom Swierk tells KTVU that Whiskey suddenly started having difficulties while chewing. Swierk was shocked to learn from Whiskey’s veterinarian that the culprit was not his dog’s tooth at all – it was an aggressive bone cancer that had made its way into Whiskey’s jawbone. The vet referred a worried Swierk to the UC Davis William R. Pritchard Veterinary Medical Teaching Hospital so that Whiskey could get the surgery and treatment he would need to save his life. Surgeons removed the cancerous growth, a malignant tumor about the size of a thumb, but it had grown so large that half of Whiskey’s lower jaw had to be removed along with it. The surgery might have led to a poor quality of life for Whiskey, Verstraete told ABC News. “They cannot catch a ball, play tug of war after such a procedure,” he explained. But thanks to the bone regrowing procedure developed by the research team, Whiskey was given a second chance. First, Arzi extracted 2.5 inches of Whiskey’s damaged jawbone. He then constructed a titanium dental bridge made of special plates and a type of spongy material infused with proteins that promote and stimulate bone growth. The special bridge was then inserted into the defect site in Whiskey’s jaw. The results were noticeable soon after the surgery, said Huey. “Within two weeks after the procedure, you could feel bone forming under the skin, and by three months we had new bone that was very similar in density to that of the native bone,” the engineer explained. Of the eight dogs that were treated as a part of the experimental study, Whiskey had the largest chunk of bone removed and would prove to be the biggest indicator as to whether or not the bone regrowing procedure would be a success. And success it was. The eight dogs who received the procedure all fared so well afterwards that Huey and Arzi hope to expand the technique for use on larger defects of the jawbone in other dogs, perhaps lighting the way for bone regrowth possibilities for humans as well.